It is not every day that private, for-profit companies pursue social inclusion of waste pickers in their supply chain. 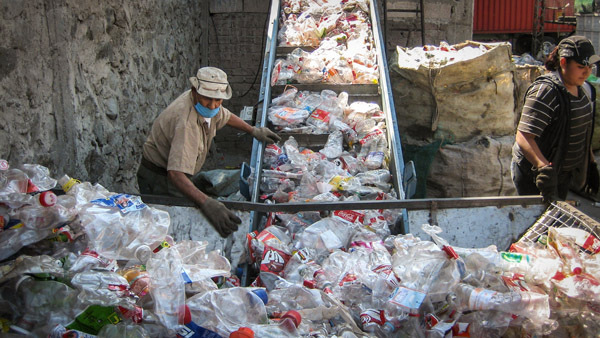 But the plastic recycling industry in Mexico is demonstrating that working with this traditionally informal sector can improve profits and create jobs, while reducing poverty, conserving resources and protecting the environment. Polyethylene terephthalate (PET) is the clear plastic resin commonly used to make beverage bottles and food containers. Though made from hydrocarbons — naturally occurring compounds sourced from non-renewable resources, primarily oil — if left to break down outside, PET can take hundreds of years to degrade. But because PET is of the polyester family it can be easily recycled into new bottles or other consumer products such as clothing and carpeting. As the world’s second largest consumer of PET bottles and the biggest consumer of Coca Cola products, (which increasingly includes bottled water), the average Mexican citizen drinks and discards two bottles per day. That equals nearly six kilograms of PET bottles per capita annually, contributing to a yearly national total of about 750,000 tons of PET. A recent survey found that, for the typical Mexican household, sodas constitute the third largest expense, after tortillas and milk. Historically, this high consumption, combined with a lack of recycling programs and the non-biodegradability of PET, resulted in a mess of discarded bottles littering the streets, public spaces, roads and rural areas throughout Mexico. In the mid-1990s, however, the Mexican government responded by asking bottlers to begin PET recovery and recycling programs, pressing the appeal by warning that without voluntary compliance mandatory measures would be coming. Indeed, what ensued has led to a current landscape in which the country’s effective PET recovery and recycling activities are voluntary efforts not mandated by the government. And, in a bid to not only aid their profit margins while safeguarding the country’s environment, the businesses involved are using corporate social responsibility programs to engage with and boost the livelihoods of the country’s waste pickers, or scavengers. And the country is leading the world in recycling food-grade plastic bottles. Chief among the country’s initial challenges in combating the bottle scourge was that the price received for recovered PET fluctuated, leaving recycling enterprises lacking bottles to process because waste pickers deemed the labour unprofitable. Bottlers continued to import virgin resin, not being able to count on national recycled material. Spurred by pressure from Mexico City’s Environment Department, as well as self-interest, Mexico’s bottling and plastics industries got together to launch a non-profit association with the aim of securing a stable domestic supply of PET. 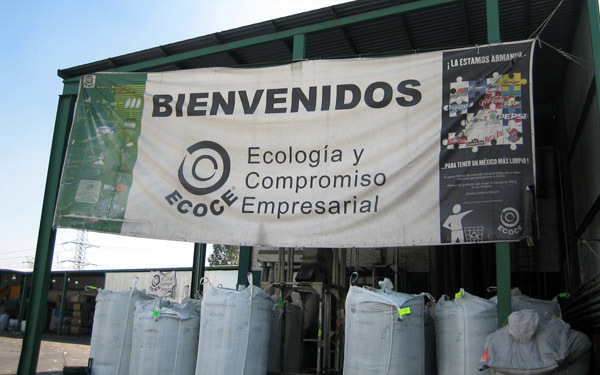 Initially putting up US$20 million to cover expenses, this corporate coalition created Ecology and Corporate Commitment (ECOCE) in 2002 in the hopes of generating a steady volume of plastic that recyclers and their bottler clients could depend on, thus establishing a blueprint for dealing with the country’s PET problem. And the effort has endured. ECOCE’s mission today is to raise public awareness, and to promote the development of infrastructure and programs “resulting in a culture of reuse and recycling of PET” in Mexico. ECOCE has three programs: community-based, school-based and industry-based. The community-based program promotes the recovery of PET among the general population. The school program, called ECO-RETO, provides incentives to schools by awarding prizes, from soccer balls to computers, depending on the amount recovered during the school year. The third program enrolls private sector companies so that employees at work or at their homes separate their PET bottles and bring them to their work places, where ECOCE picks them up once a month. They can receive cash or various items as an incentive. Alternatively, they can donate the proceeds to the charity of their choice. As a testament to its successes, the association boasts that the amount of PET recuperated in the country, which in 2002 was 8.8 percent, rose to 35 percent in 2012. This puts Mexico, according to ECOCE’s statistics, as the world leader in recycling food-grade bottles. ECOCE attributes this achievement partially to ECO-RETO, which in 2011-2012 involved around 1.8 million students and 6,463 schools in 65 metropolitan areas across the country. ECO-RETO, the association says, has had a multiplier effect on family participation and has led more than 8 million people (i.e., the waste generators) to become involved in household PET separation and recycling. Playing a large role in Mexico’s activities is a Huston-based recycling services company called Avangard Innovative, the Mexico subsidiary of which began collecting discarded PET in 1995 and then became the first authorized ECOCE gatherer. 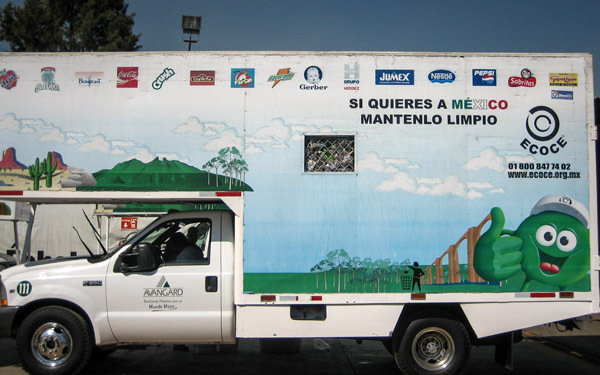 With a collection chain that includes 1,300 suppliers throughout the country — such as collection points at dumpsites, landfills, school recycling programs, and large scrap dealers — Avangard is able to reclaim over 74,000 tons a year, which is nearly 10 percent of post-consumer PET generated in Mexico. About half of this is recovered by scavengers. Early in Avangard’s operation, all the recovered material was exported to China, the United States, and other countries, while Mexican bottlers continued to import virgin resin to make new PET bottles. Mexico lacked the capability to recycle PET into food-grade resin. But in 2008, a further move came to close the loop by implementing a PET bottle-to-bottle recycling program completely within Mexico, hoping to generate a cycle of social, economic, and environmental benefits. Avangard and Promotora Ambiental S.A. de CV (PASA) — a leading Mexican environmental services business with operations in 42 cities — formed a strategic alliance with the aim of building a plant, Petstar, capable of processing PET for bottle-to-bottle use. Using state-of-the-art technology, the plant transforms the recovered PET into resin that can be used to make new beverage bottles. “This way we eliminate dependence on volatile international markets, especially China’s. There is also the concern of being able to offer the [Mexican] bottling industry a high-quality recycled material that they can use in their bottles to meet their sustainability goals,” says Jaime Cámara, Petstar’s director general. As part of the IFC loan to build the recycling plant, Petstar had to comply with the IFC’s social and environmental safeguards. Two of those safeguards referred to the reduction of child labour involved in the recovery of PET and the improvement in sanitary conditions of waste picking, particularly at the dumpsites. In order to address both issues, Petsar decided to create a corporate social responsibility (CSR) programme. This is perhaps the first programme of its kind in the world. About half of the PET that Avangard Mexico (now a subsidiary of Petstar) collects in the country is recovered by waste pickers. Scavengers in developing countries have low incomes, mainly because industry usually does not purchase recyclables directly from them because its minimum volume demands are beyond what most scavengers can provide and because the materials still need to be sorted, cleaned and baled, adding other labour costs for the purchaser. In the usual supply chains, middlemen obtain high profits by paying low prices to scavengers. Circumventing the middlemen is a goal for many organized scavengers, but it is impossible if industry decides not to work with them. But in 1995 Avangard/Petstar decided to break this trend, purchasing PET directly from scavengers, at a fixed price, via the ECOCE’s own collection trucks, which visit Mexico’s main dumpsites and landfills periodically, usually every day. At some dumpsites, however, leaders control the sale of materials. The leaders sell the collected PET to ECOCE, but may pay a lower price to the waste pickers, pocketing the difference. Thus, at present ECOCE does not buy directly from all waste pickers. Open dumping constitutes the main disposal method for solid wastes in Mexico. Because most scavengers do not wear any protective equipment, the health risks they face are high due to daily contact with mixed wastes at open dumps. Further, due to scavengers’ low incomes, they are unable to send their children to day care centres and many school-aged children start recovering recyclables in order to contribute to the family income. This can perpetuate their poverty and keep them as scavengers for the rest of their lives. 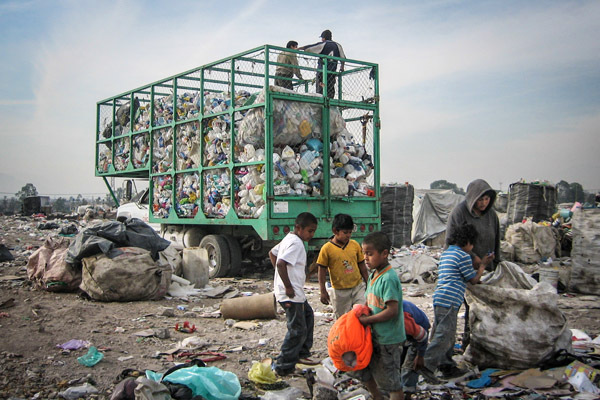 Children working at the dumps suffer many more illnesses and injuries than in the general population. Particularly prevalent are gastrointestinal, respiratory and skin diseases, lead poisoning and cuts from needles and broken glass. As a result, scavenging may permanently damage a child’s intellectual, emotional, and physical development, condemning them permanently to poverty and shortening their lives. Scavenger communities, like many marginalized social groups, often also suffer from social problems such as alcoholism and domestic violence. In response to the dire risks and issues faced by its scavenger supply chain, Avangard decided to create a CSR programme in 2002 and contracted Fundación Mundo Sustentable, a Mexican NGO, to implement it. Avangard decided to focus initially on two pilot sites: a controlled landfill in Tijuana — on the US-Mexico border — and an open dump in Chimalhuacán, near Mexico City. Several hundred scavengers work at these disposal sites and the CSR programme works directly with them, creating low-tech Materials Recovery Facilities (MRFs). Materials at these MRFs are separated into different categories: paper, cardboard, ferrous metals, glass, plastics, and so forth. Then they are processed, baled and shipped to industry. Sanitary conditions at MRFs are significantly better than the recovery at dumpsites. 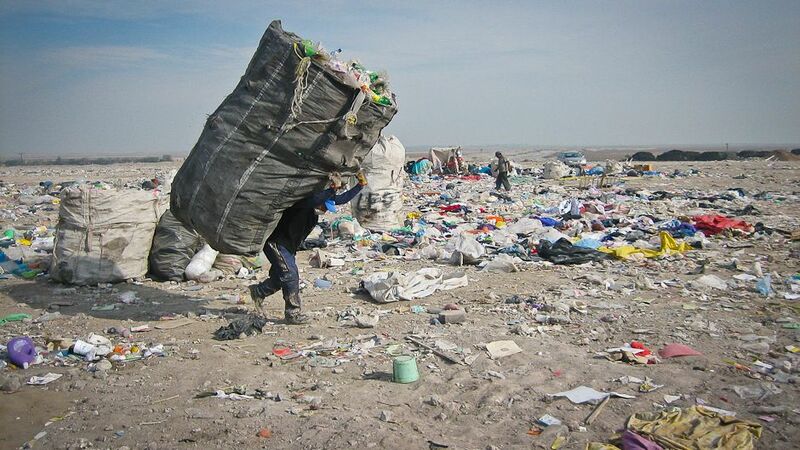 At dumpsites waste pickers come in contact — usually without any protective equipment, such as gloves, face masks and boots — with all type of wastes as well as harmful gaseous emissions and liquid leachate that the dumps generate. MRFs are industrial facilities, where employees must wear protective gear. Another essential priority for the company’s social responsibility efforts is to reduce child labour and contribute to a better future for the children of its supply chain families. To that end, the company created two Children’s Development Centres, one in Tijuana and the other in Chimalhuacán. Each centre provides educational and recreational activities, as well as free lunch and medical care. Fundación Mundo Sustentable (Sustainable World Foundation), formed by PASA, has partnered with Danone and Ashoka in operating the two centres. Thanks to this programme, about half of the post-consumer PET recycled by Petstar is now recovered without child labour. A further part of the social strategy is helping 1,500 scavengers get organized into cooperatives, like those established in Tijuana and Chimalhuacán. Individually, scavengers have been traditionally powerless to improve their own lives. In many cities, street and dumpsite scavenging is illegal or scavenger livelihoods fall victim to unfriendly public policies and there is little that individual scavengers can do to change this. In many cases the police can confiscate the recovered materials and/or the vehicles used to transport it. Alternatively, they may demand bribes to release the vehicles/materials or to allow the scavenger to continue recovering materials. But when scavengers collaborate and get organized together, they can spur positive change as has recently happened in Brazil, Colombia and India. Getting organized can lead to empowerment, an ability to sign contracts with government or private companies, poverty reduction, and grassroots development. Mexico’s PET efforts are indeed inspiring. Thanks to growing consumer awareness brought by ECOCE’s campaigns, the country is reducing littering in public places and the amount of wastes that need to be collected, transported and disposed of. Additionally, keeping the plastic scourge out of dumps not only extends the life of waste disposal facilities but is a CO2 saver as well: for every pound of PET that is recycled instead of using virgin resin, 84 percent less energy is used, reducing greenhouse gas emissions by 71 percent. Further, Avangard/Petstar’s corporate social responsibility efforts demonstrate that it is possible to operate a private recycling program that is profitable and, at the same time, generates social, economic and environmental benefits by working with scavengers and collaborating with industry via non-profit initiatives. This program can be replicated in other developing countries, helping industry reduce its ecological footprint and partially offset greenhouse gas emissions while making a positive impact on the livelihoods of the poor. Social Inclusion in Mexico’s PET Plastic Recycling by Photo Martin Medina and Carol Smith is licensed under a Creative Commons Attribution-NonCommercial-ShareAlike 3.0 Unported License. With interests in community-based resource use, the informal recycling sector and solid waste policy and planning, Martin Medina has collaborated with academic, nongovernmental and international organizations on waste management projects in Africa, Asia, Latin America and the Middle East. He holds a Ph.D from Yale University, is a former UNU-IAS fellow, and author of the book The World’s Scavengers: Salvaging for Sustainable Consumption and Production. His current work at the US National Oceanic and Atmospheric Administration focuses on international cooperation on the use of satellites for weather forecasting, environmental monitoring and disaster management. Medina is currently writing a book on the informal recycling sector in Mexico. The whole article is about Mexico and there are several companies/organizations involved. Perhaps you might reread the article to decide which you are interested in?